The Baltistan Winter Sports and Cultural Festival 2016 was recently held in the Hussainabad area of the region. Many community members joined to celebrate the winter and enjoyed traditional winter games in temperatures as low as 16 below zero. 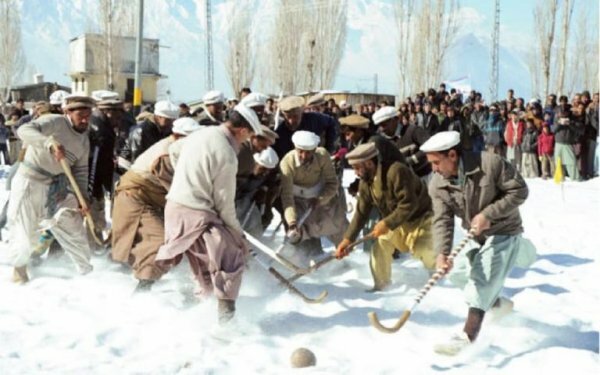 A sports and cultural festival was organised amid temperatures as low as minus 16-degree centigrade on a snow-covered playground in Hussainabad area of Shigar valley here the other day. The event titled ‘Baltistan winter sports and cultural festival, 2016’ was jointly organised by Pak Army, district administration and Bazme Elm-o-Fun Skardu. A large number of people turned up. A peace walk was also arranged in the icy field led by 62 Brigade Commander Brig Ahsan Mehmood. A traditional ‘Ko Polo’ game played on the occasion ended in a draw with each team scoring a goal apiece. Later, the winner was decided on toss. Ko Polo is a free-style game of Baltistan played by adults. In the past people used to play the game in agricultural fields during harsh winter, where a heavy leather-made ball is hit with sticks. As there are no rules regulating the game, Ko Polo is considered a dangerous sport. A player is said to have died while playing the game in Shigar in the past. Though the traditional game has died down elsewhere in Baltistan it is still famous in Shigar valley. In the daylong winter sports gala, ice football and ice volley contests were also held between the teams of Hussainabad and Skardu. On the occasion, youngsters demonstrated martial arts, while the players and spectators danced to the local music. Earlier, addressing the inaugural ceremony of the festival, Brig Ahsan Mehmood said the unique culture of Baltistan needed to be preserved and promoted. He lauded the efforts of players and said they proved that the people of Gilgit-Baltistan were always ready to safeguard the frontiers of Pakistan. A local historian and scholar Mohammad Yousuf Hussain Abadi also addressed the ceremony and said the winter sports festival provided an opportunity of entertainment for the local people.